Welcome to Rocking B Farms, the sign reads as I pull into the driveway. “Here we go”, I say to myself. “let’s do this”. I’m my usual fifteen minutes early, so I park my car and sit for a few minutes. Talking to myself, I ask, “are you sure about this?” “your experience with horses is sketchy, ya know. what if you look silly”? “Breathe”, I say back to myself. “it’s going to be alright.” “you’ve been wanting to try new things and this is as new as it gets”. “be brave….now get out of the car and go find this woman Cathy”, my inner cheerleader boldly encourages. I begin to walk towards the barn. I see there is an expansive arena in the middle and hugging each of its sides, are large, hefty wooden stalls, each one housing a gorgeous, magnificent, bigger than life, horse. The energy in the air feels lovely, joyous, happy. People are smiling, laughing and it calms my nerves. As I stroll down the aisle, passing each stall, hearing the crunching hay, the nickering of the horses talking with one another, I sense within myself an inspiration of tranquility. They all seem very content. Some of them look at me and others are peacefully standing out in their paddocks enjoying the warmth of the golden sunny day. My mind begins to settle sending a signal to my body that it is safe to relax. “Whew” , I whisper to myself, taking a long deep breath. 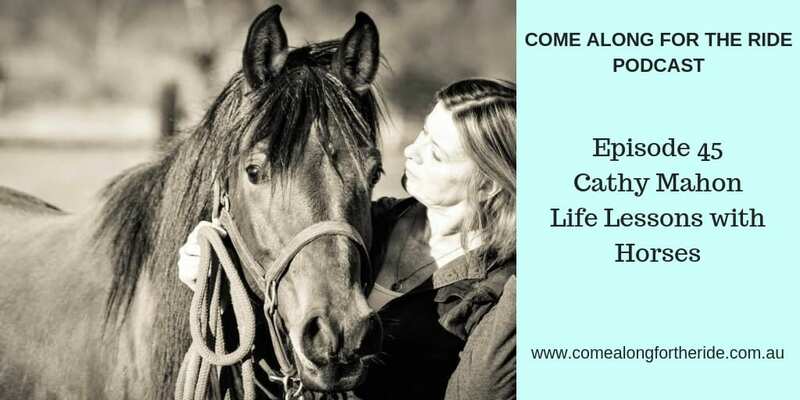 Perhaps the flier for this session is correct and I recall what caught my interest in the first place, “Just by spending FIVE minutes with a horse, you’ll learn something about yourself. I GUARANTEE IT!”~Cathy Mahon. In five minutes time, I had already proved to myself I can do anything if I really want to. And I really wanted to come today. For the past few weeks now, I’d been thinking about getting out more and being part of something new and exciting. I love nature and although my experience with horses was little, the thought of spending time up close and personal with them in a safe environment, sparked great happiness inside me. So here I am, getting out and about to embrace something different, something unfamiliar and something that I hoped will change my life forever. Cathy is a tall woman, a woman that I instantly associate with grace and ease. She walks with a steady gait and filled with confidence. I am drawn into her presence and immediately feel comfortable. She introduces herself and then invites me to walk with her to an outside round pen and sit with her in two chairs that have been placed outside of the pen. The sun is in its full glory today and a breeze wafts through the air kissing our faces with its warmth. She offers me a bottle of water and as we sit and chat I feel as though I am immersed in a conversation with a long-time wonderful friend. I am completely comfortable expressing my thoughts as she attentively listens without the slightest of interruptions. When I’m finished with my latest personal story she asks, “are you ready to share your story with the horses and see what they think?” “Sure”, I say. “why not”, I say to myself. This is why I am here. To explore my inner stirrings of discomfort and perhaps discover a treasure that will give me inner peace. 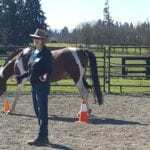 According to Cathy, the horses can lead me to my inner treasure map and then it will be up to me to realize what I seek. I am very interested in embarking on this new exploration of my life. I feel excited, enthusiastic and even a little scared. Cathy welcomes me into the round metal enclosure where a horse stands quietly. He is colored in sienna red, accented with a long black mane glistened with highlights of yellow gold cascading down his left shoulder. His body is large, encompassed by hefty muscles and feet the size of boulders, obviously portioned to carry his substantial heavy, massive frame. He reminds me of standing at the Grand Canyon; a true specimen of exemplary natural beauty. As I did there, I now here, stand in complete awe at the magnitude of his presence. Cathy tells me his name is Saguaro. Named after the Saguaro Cactus of the desert that stands strong with tremendous stature and authority. Our session begins with a moment of quietude. It envelopes us so completely I wonder if everyone has gone and we are the only ones left on the farm. What I soon notice is the three of us are simply standing in a state of mindfulness and I have lost all track of the outside world. For a minute I am a blissful state of peace. And then, in the next minute, I am startled and my body goes into panic mode and I hear the words “Whoa, Whoa, shhhh…..”, as I observe Cathy gesturing to the once calm horse now anxiously running around the enclosure to what seems to me, a run, not for the roses, but for an escape route. Cathy quietly and succinctly motions me to stay in the middle and within a few moments she has calmed the horse and he begins to slow to a walk. In seeing the excitement on my face, Cathy comes over to me and puts her hand on my shoulder. “you ok?” she asks? Frozen in my own inner anxiety, I am only capable of nodding my head a convincing yes. “What happened?” I ask. 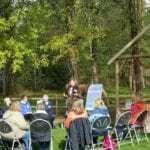 Cathy explains that while we were being quiet, there was a rustling in the barn of banging and clattering and the horse knows what that means. It’s feeding time. “What you observed as panic in the horse, was just that. He is worried his buddies are dining without him. Horses don’t like to be left out. But he is fine now. He understands we are safe for him and he can wait patiently to join the others.” “You did well, by staying calm and staying put”. “Thank you for adhering to my signal” she says. I smile, “Well, seeing as you are the expert, and I myself feel safe with you because of your demeanor, I felt safe doing exactly what you asked.” I went on to explain, “at the moment of your “whoa”, my own instincts kicked in and I trusted you. I knew in my core I was safe.” “Do you always find it easy to trust your instincts?” Cathy inquires. “Most times”, I reply. “I’m glad this was one of those times”, she adds. “Me too”. I concur. “Alright then, let’s move on”. I thought about what just happened while Cathy was gathering up a halter and lead rope to put on the horse. I have often felt anxious about being left out. In the past, it was being left out of parties or gatherings or simple conversations at work. Lately, it seemed I was being left out of my own life. Seeing Saguaro run around in circles with worry, reminded me of running around in my mind worried about missing out on my next meal. My next meal of fun, laughter, joyful adventures. 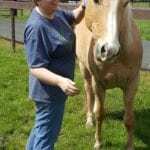 After witnessing Cathy’s ability to calm the horse so quickly I felt heartened that I could do the same for myself. Being here appears like a good start I consider to myself. Cathy proceeds to put the halter and lead rope on the horse, walks over to me, hands me the lead rope, and says, “here you go, take him for a walk”. “Sure”, I say,– “looks easy enough”. I take two steps and the horse takes none. I take two more steps this time with a little smooch like I’m calling, “here kitty kitty, c’mon now”, and then two more with a little tug and before I know it, I am literally at the end of my rope. The horse, well he’s now back at the coral. In other words, he never took one step. With a quizzical raise of my eyebrows, I look over to Cathy, who is now standing on the outside of the round pen, and ask for her input. As the skilled coach that she is, she proposes questions to me. “What do you think this means?”, “Why do you suppose the horse is reluctant to walk with you?”. “well”, I say, “seems as though I’m not as interesting as the hay being served over in the cafeteria next door.” Cathy laughs and encourages me to try again. She guides a little, “picture the two of you together and feel it first”. I nod back in understanding. This time, I stand next to the horse at his shoulder, about an arm’s length away, the place and distance Cathy has instructed me is a good safe space. I pause and for a few seconds I see in my mind’s eye the two of us, walking side by side, feeling as if we’re best friends. I then turn to the horse and I silently invite him to join me. I lean slightly forward, lift my left foot barely off the ground, and wait….all the time holding my vision of the two of us taking stride. I then feel his weight shift and we’re off. Not like the races but more like a stroll down memory lane. We have lift off! We make it one full circle, and then another and another. We walk and I talk, just the two of us. Me telling my story to the horse, and the horse, through its willingness to accompany me, aligns my mind with my heart and with it, feelings of harmony and acceptance. Feeling happy and relaxed, we approach the gate and just before we stop, I take a long deep breath, lower my shoulders and sink my feet into the ground. The horse mimics me, snorts his own sigh and plants his feet next to mine. “That was beautiful!”, Cathy comments as she walks back in. “How did that feel?”. I have no words, just a smile from ear to ear. There is a moment when life turns from black and white to color. This was that moment for me. Walking side by side with Saguaro stirred up the muck I had been carrying lately and with his presence of stability I found the courage to bring it to the surface and acknowledge it. Without judgement, because horses don’t have any, I felt the strength to let it go. The more steps we took in the round metal enclosure the more my discomfort rose out of me and through me. By the time we stopped, my body felt lighter and my mind felt brighter with the possibilities yet to come. I closed my eyes and in my mind’s eye, I pictured the white dull lights of my life turn to vibrant, bold colored sparkles of joy. Hopefulness had turned to optimism. What is it that horses do for us that create such a change within us we can be so inspired to create a change outside of us? 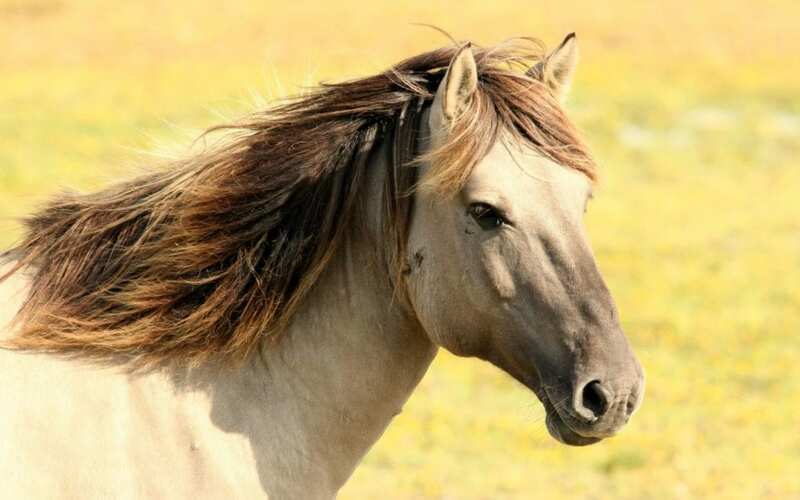 Since horses cannot connect with the drama of our life story and they can’t judge good or bad or feel guilt, horses offer us authentic feedback. If we open up to our vulnerability and stay present we can receive their gift of acceptance. A genuine treasure of inner peace. The sun is beginning to descend on this day and our session has come to an end. I share with Cathy that I want more of this. My mind is filled with curiosity and I want to explore and discover even more of these life lessons with horses. “Sign me up”, I say. This was fun! Thank you for sharing my personal experience. Hope to see you there soon.